● ● ● ● trends FE&S reports on the hottest trends in tabletop design, concept development and other areas of the foodservice industry — both at the back and front of the house. 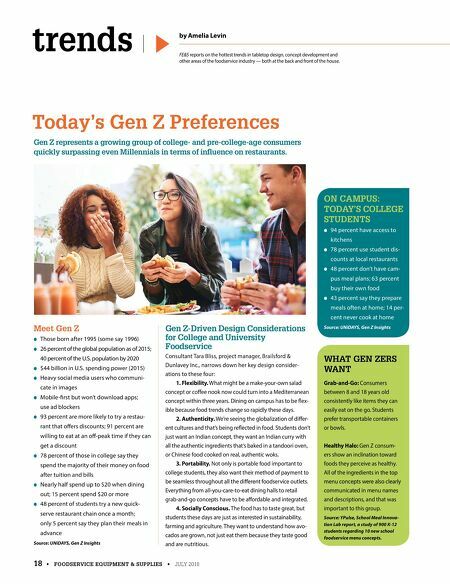 by Amelia Levin Today's Gen Z Preferences 18 • FOODSERVICE EQUIPMENT & SUPPLIES • JULY 2018 Gen Z represents a growing group of college- and pre-college-age consumers quickly surpassing even Millennials in terms of influence on restaurants. ON CAMPUS: TODAY'S COLLEGE STUDENTS ● 94 percent have access to kitchens ● 78 percent use student dis- counts at local restaurants ● 48 percent don't have cam- pus meal plans; 63 percent buy their own food ● 43 percent say they prepare meals often at home; 14 per- cent never cook at home Source: UNiDAYS, Gen Z Insights WHAT GEN ZERS WANT Grab-and-Go: Consumers between 8 and 18 years old consistently like items they can easily eat on the go. Students prefer transportable containers or bowls. Healthy Halo: Gen Z consum- ers show an inclination toward foods they perceive as healthy. All of the ingredients in the top menu concepts were also clearly communicated in menu names and descriptions, and that was important to this group. Source: YPulse, School Meal Innova- tion Lab report, a study of 900 K-12 students regarding 10 new school foodservice menu concepts. Meet Gen Z ● Those born after 1995 (some say 1996) ● 26 percent of the global population as of 2015; 40 percent of the U.S. population by 2020 ● $44 billion in U.S. spending power (2015) ● Heavy social media users who communi- cate in images ● Mobile-first but won't download apps ; use ad blockers ● 93 percent are more likely to try a restau- rant that offers discounts; 91 percent are willing to eat at an off-peak time if they can get a discount ● 78 percent of those in college say they spend the majority of their money on food after tuition and bills ● Nearly half spend up to $20 when dining out; 15 percent spend $20 or more ● 48 percent of students try a new quick- serve restaurant chain once a month; only 5 percent say they plan their meals in advance Source: UNiDAYS, Gen Z Insights Gen Z-Driven Design Considerations for College and University Foodservice Consultant Tara Bliss, project manager, Brailsford & Dunlavey Inc., narrows down her key design consider- ations to these four: 1. Flexibility. What might be a make-your-own salad concept or coffee nook now could turn into a Mediterranean concept within three years. Dining on campus has to be flex- ible because food trends change so rapidly these days. 2. Authenticity. We're seeing the globalization of differ- ent cultures and that's being reflected in food. Students don't just want an Indian concept, they want an Indian curry with all the authentic ingredients that's baked in a tandoori oven, or Chinese food cooked on real, authentic woks. 3. Portability. Not only is portable food important to college students, they also want their method of payment to be seamless throughout all the different foodservice outlets. Everything from all-you-care-to-eat dining halls to retail grab-and-go concepts have to be affordable and integrated. 4. Socially Conscious. The food has to taste great, but students these days are just as interested in sustainability, farming and agriculture. They want to understand how avo- cados are grown, not just eat them because they taste good and are nutritious.